One pair of Trident Owners have earned their own chapter in the Cruising History of the Trident. 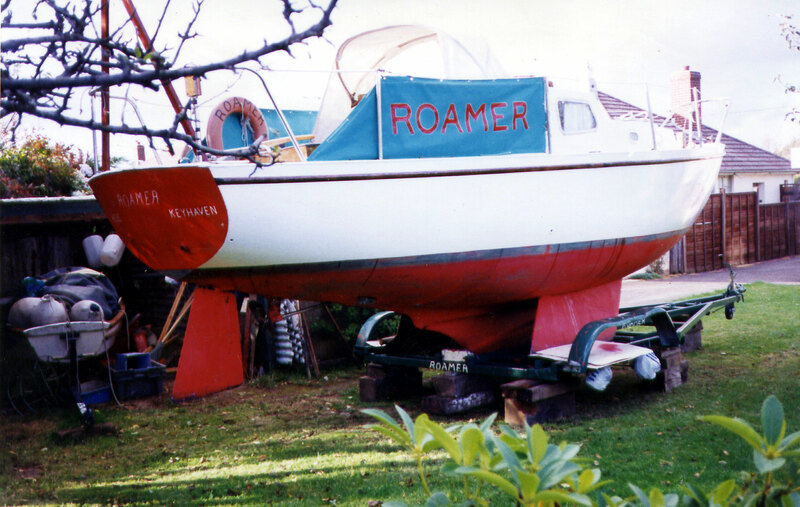 “Mitch” and Audrey Mitchell completed No 67 Roamer from a bare hull in their garden in 1968. Since then they have sailed her further than the 24,000 mile circumference of the World. In the 40-odd years since they completed Roamer, they have left a wake stretching for tens of thousands of miles. They have crossed the Channel over 100 times, been to the Mediterranean three times and ranged from Holland to Spain from their base in Keyhaven. Mitch, Audrey and Roamer were present at the first ever TOA rally on the South Coast and have rarely missed one since, unless they were away cruising. They are the longest standing members of the TOA and must have sailed many more miles in a Trident than any other owner. Their Channel crossings alone account for more than 15,000 miles. Not surprisingly they have won the TOA Marcon Trophy a record four times. When it comes to Trident ownership, Mitch, as they say, wrote the book – literally. A few years ago he published his sailing memoirs privately for the benefit of his family in a fascinating volume: Struggle for a Boat by A C J Mitchell. Like Inspector Morse, not many seem to know A C J Mitchell’s first name (Arthur). He is always known as Mitch. Born in the New Forest in 1926, his first memory of getting afloat was in the 15 foot clinker dinghy his father used for angling. 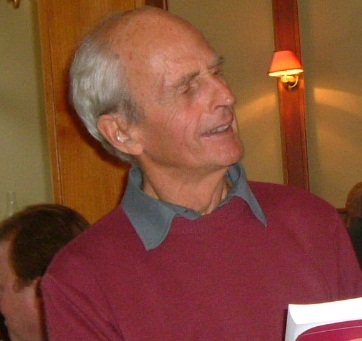 Mitch’s day job was at the Ordnance Survey in Southampton and in 1950 he bought his first boat on the River Itchen, a heavy twelve foot Bermudan-rigged dinghy that “leaked a little, sometimes a lot”. In this boat Mitch taught himself to sail around Christchurch harbour. But his eye had always been on cruising, having been inspired by R T McMullen’s Down Channel. So Flying Saucer, a 16 footer with a drop keel and a lifting cabin top, soon replaced the dinghy. With an old War Department handbearing compass, two charts and the oars in case the wind failed, Mitch was ready for his first cruise in June 1951 – and the first of many logbooks. In short, for Mitch, the perfect wife though they were not to marry until 1957. In the meantime, cruises together were primly shaped so Audrey could catch the bus home to Parkestone each night. At their marriage Mitch’s father predicted that from now on there would be no time for boating. Little did he know. When they did eventually set up home together, the boat came too. “We were fortunate to be able to buy a plot of land in Barton-on-Sea for £450 which in those days was a lot of money. Audrey knew a builder who could build us a bungalow for £1600 to our design, which meant it would be lengthwise on the plot , leaving room to get boats to the rear.” With the two sailing sons that were to follow, Mitch reckons he has worked on 26 different boats behind that house. 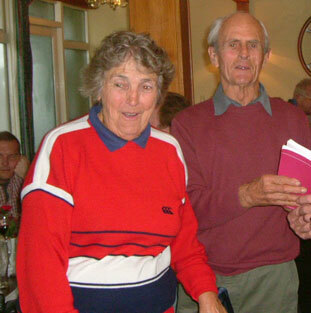 Until 1960, Mitch and Audrey had no car and cycled the six miles to Christchurch and later to their mooring at Keyhaven at the western end of the Solent. Sometimes they had a 20 foot mast or an outboard engine strapped to the bike. That same year Mitch launched Freedom, an 18 foot open wooden boat on which he had spent 800 hours fitting a cabin. In that first year they made their first circumnavigation of the Isle of Wight. And the following year they embarked on their first trip abroad to Cherbourg; a cold overnight crossing of about 21 hours requiring the Seagull engine to be refuelled seven times. 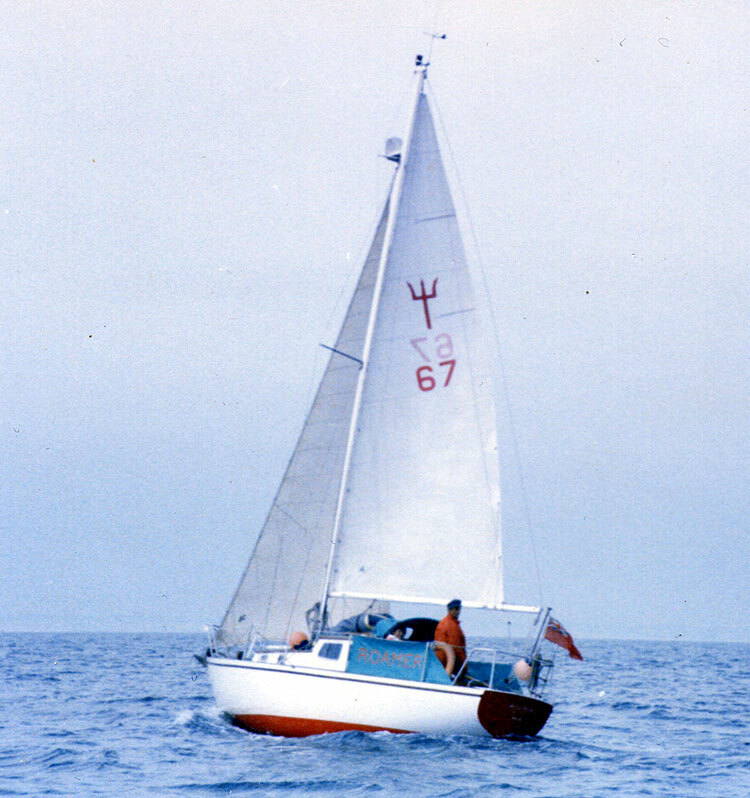 That winter (1961-62) Mitch completely rebuilt and re-rigged Freedom. At the start of the following season, they sailed until mid June. There followed a short break during which Audrey gave birth to their first son Malcolm. Mother and baby left hospital on 15 August. Two days later they were sailing again. And the following May they made their second Channel crossing with a teething Malcolm and a primitive RDF aboard. The RDF didn’t work with the outboard running. But Malcolm was fine. The two-berth Freedom gave way to a three-berth Alacrity called Venture in 1964. A 400 mile cruise to Boulogne and Calais followed. But by 1967 another addition to the crew was expected. Unable to afford the £1,655 Eric White was asking for a complete engineless home build Trident kit, Mitch purchased just the bare hull. When the it arrived from Marcon, Mitch was in Lymington hospital with a kidney stone problem. But he was soon home and fitting out the hull under a driftwood and black plastic tent. 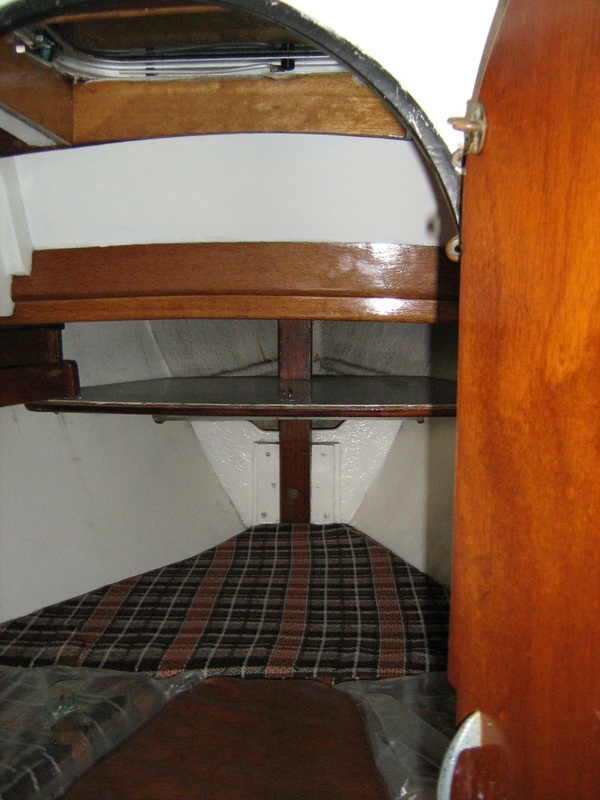 Working from plans supplied by Eric the boat took shape in mahogany and oak with marine ply decks. Meanwhile Audrey gave birth to their second son Raymond. “We bought all standard fittings for the boat from Eric White but we had no money for the spars, rigging, sails, anchor or chain. In discussing my income, I believe he felt sorry for me and agreed to provide them on an interest-free arrangement. Not many business people would do that; it is the kindest thing anyone could have done for us,” Mitch recalls. 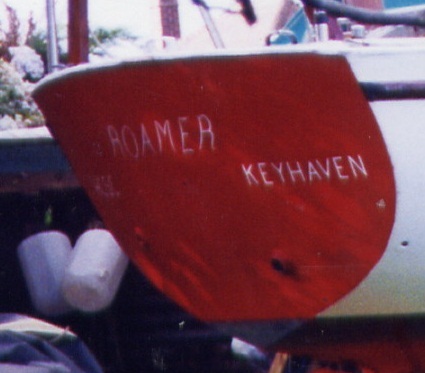 Roamer was launched a year later on 14 June 1968. “We lit the cooker and it all went up in flames and looked frightening until I put the extinguisher into play,” Mitch recalls. “What a thing to happen on launching day.” The toilet was a bucket and the stern was tube sealed off as there was, as yet, no inboard. But a month later they were heading for Cherbourg, Omonville (“a pleasant place… no harbour dues”) and Alderney, returning via Weymouth. The following year, 1969, they crossed again to Cherbourg before coasting east to Barfleur and Honfleur and partway up the Seine returning from Trouville in winds up to Force 6. “It was a hard passage but I had a good crew. Malcolm and Ray had already spent so much time on the boat they were quite used to it.” Malcolm must have been 7 and Raymond 2. In 1970 they crossed to Cherbourg in fog so dense that, even when inside the outer harbour, they could not locate the yacht basin. Cruising west they visited Alderney, St Peter Port and Herm before crossing to Dartmouth and returning to Keyhaven via Lyme Regis and Weymouth. In 1971 they visited St Vaast and Carentan at Whitsun. 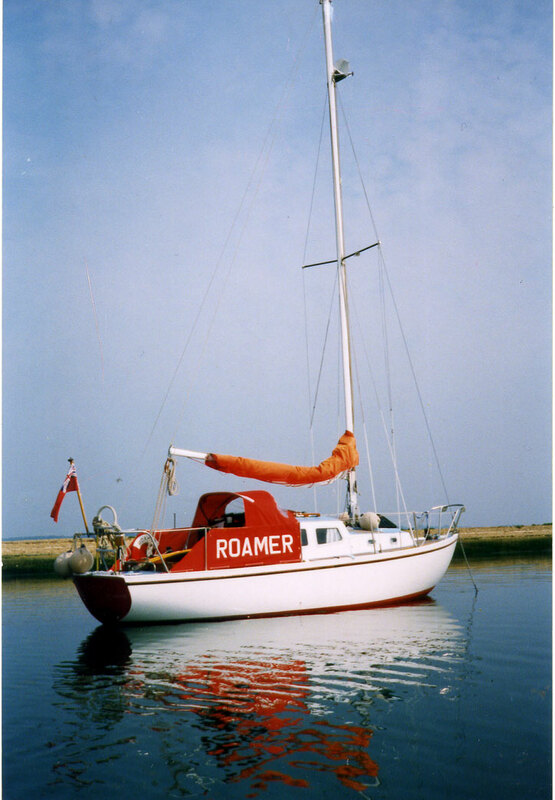 In 1972 Roamer was treated to her first inboard: a one-year-old Vire bought secondhand from a Sabre standing in Marcon’s yard on the Itchen. Mitch knew little of inboards but Eric White helped him remove it. With their powerful little motor they set off for France again that summer but were forced to turn back for Swanage and Portland in bad weather, eventually crossing to Alderney, Jersey and Guernsey before returning via Cherbourg. Roamer spent nights aground alongside the stone pier in Braye Harbour and in St Sampson’s commercial harbour: both strictly forbidden to visitors. In 1973 they crossed to Cherbourg and Alderney for the Whitsun school holidays and cruised to the West Country in the summer, sailing up the Fal to Truro. In 1976 they made a 400 mile cruise to Brittany, visiting St Malo, Dinan and the Iles de Brehat and in 1977 they reached the Scillies, returning via Guernsey and Alderney, again illicitly mooring in the residents-only Crabby Harbour. By 1978 Malcolm was 16 and Ray 11(“both pretty good hands”). On a month-long cruise to Holland they covered 527 nautical miles which “hardened our resolve to do much longer cruises when time permitted”. Meanwhile, cruises on both sides of the Channel continued. They spent the 1979 Fastnet gale lashed by five warps to a buoy in Braye Harbour Alderney. Conditions were far too bad to even contemplate rowing ashore. In 1983, aged 57, Mitch took early retirement from the Ordnance Survey after almost 40 years service. He still needed to do some work and took on various casual jobs – mostly decorating. The Vire was also retired and replaced with a more economical 7hp Petter diesel : 20 miles to the gallon compared to the Vire’s 12. In 1987 Mitch and Audrey sailed Roamer to the Med for the first time, leaving in April and arriving in Paris on May 17 via the River Seine. After a week in the Arsenal Marina they proceeded via Dijon and Lyon and the Rhone to arrive on 15 June at Port Louis on the Mediterranean, 1,000 miles from Keyhaven. 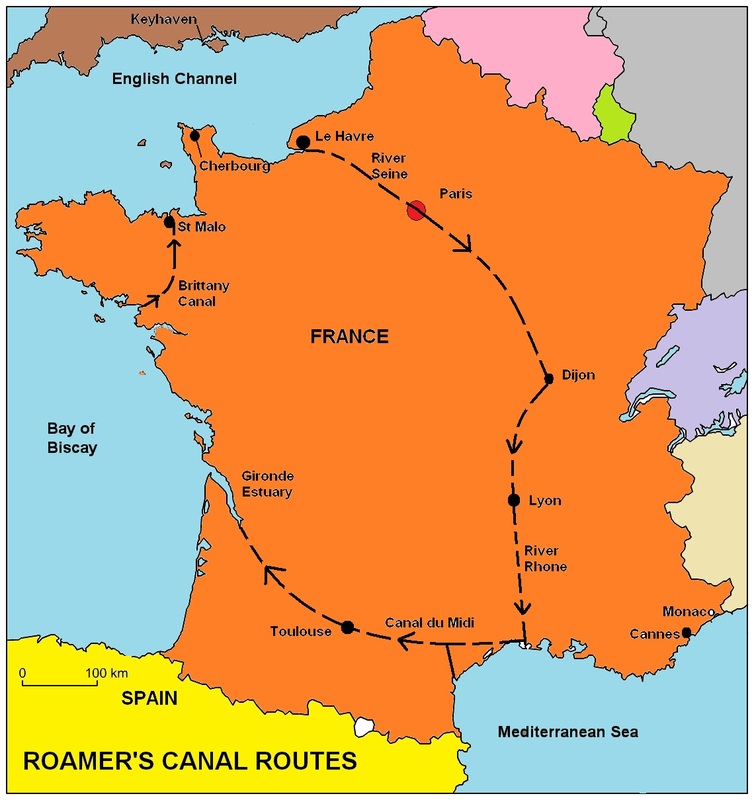 They cruised eastwards towards St Tropez and westwards into Spain before starting their return journey via the Canal du Midi to the Gironde Estuary and the Bay of Biscay. After coasting north, the Brittany Canal via Rennes and Dinan brought them to St Malo, Alderney. The following year Mitch and Audrey sailed 800 miles in an anticlockwise circumnavigation of Brittany, first cruising westwards along the north coast before returning to St Malo, again via the Brittany Canal. They left towards the end of May and got back at the end of July. The following year they sailed to Barcelona via Paris and the Rhone. And in 1992 they returned to the Riviera intent on sailing eastwards towards the Italian border. They reached the Med at Port St Louis 20 days after leaving Keyhaven and visited Cannes and Nice. In Monte Carlo they were turned away from the marina on the grounds there was no room and anyway Roamer was too small. Returning to Keyhaven, this time via Paris, they had clocked up another 2,392 miles and Roamer had earmed another new engine: a Yanmar GM10. 1993 saw them cruising Brittany in company with friends and in 1994 more inland canal work in an 800 mile cruise to Bruges and Lille. And in the years that followed they continued to cross the Channel, visiting the Somme and the Baie du Seine, often in company with friends and fellow members of the Hurst Castle Sailing Club. Audrey and Mitch have fittingly been made honorary members of the TOA in recognition of an incomparable record of cruising in a Trident: an inspiration to young and old alike and an achievement that it is hard to imagine ever being equalled.